Jon Crawley studied art at the Ballarat School of Mines Technical Art School from 1967 to 1970. He was taught by David Kelloch, Henry Moritz, Bernie Bryan, and Geoffrey Mainwarring, who was a life long mentor to the young artist. During 1971 Jon Crawley completed a Diploma of Education at the State College of Victoria (Hawthorn), and was named dux of that year. He was appointed Head of the Art Department at Collingwood Technical School the following year, and was seconded back to the State College to Lecture in Art Education on a part-time basis. Jon was appointed full-time to the State College in 1973 and implemented an Alternative Diploma of Education for Technical School teachers. Jon Crawley obtained a Bachelor of Education, Honours, (La Trobe) in 1975, and started a Master of Education the following year. Tiring of the Melbourne "rat-race" Jon returned to Ballarat in 1977 when a new school at Mt Clear was announced. Jon Crawley taught at the school from 1977 until early 1994. Jon then established a studio where he has run Art classes for the general public and talented children while continuing to develop his own artworks. In 1991 Jon Crawley was invited by the Victorian Agent General to exhibit at Victoria House in London, which led to an invitation to exhibit at a fundraiser to save the London Zoo, an initiative of Prince Charles and Princess Diana. Further exhibitions ensued at the Omell Gallery in London and Taunton in Devon. 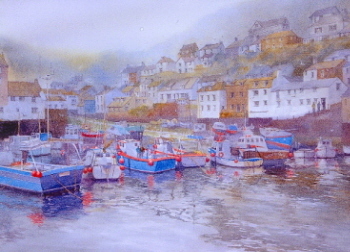 Working as a full time professional artist and educator since 1994, Jon Crawley has gained a reputation for his Impressionist style watercolour, oil and pastel paintings and his delightful drawings. Jon Crawley's work has been widely exhibited in Australia. He has held over 40 exhibitions and has won upwards of 400 awards for his work, including the prestigious Camberwell Rotary Art Show. Jon has written for Australian Artist and International Artist magazines and has been contracted to illustrate around 30 books. 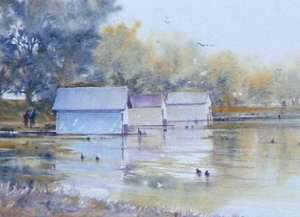 In 2000 he was announced an International Master Water Colourist, and in 2007 won third prize in an international award conducted by Australian Artist. 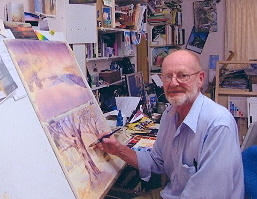 Jon Crawley has been a member of the Ballarat Society of Artists since 1984, serving several terms as President. He has been a member of the Wildlife Artist's Society of Australasia, the Victorian Artist's Society, the Australian Guild of Realist Artists and the Old Watercolourist Society of London (Australian Branch). Jon Crawley's work is held in many private, public and corporate collections throughout the world. In December 2009 Jon received a certificate from the National Australia Day Council when he was nominated anonymously for "Australian of the Year" for his contribution to Art, Education and support of charitable and community bodies. This biography prepared by Clare Gervasoni, February 2010.